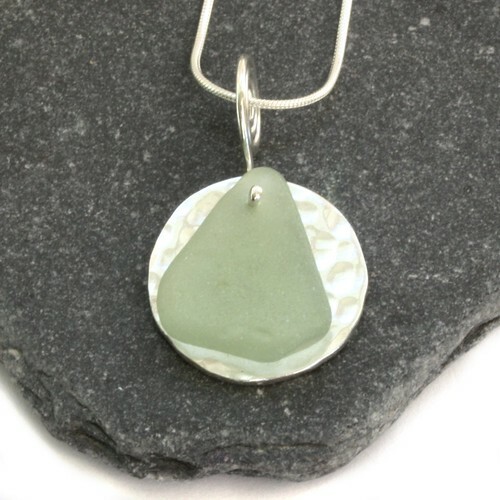 I've been enjoying working with silver clay recently and this pretty little pendant features a hammered silver circle, made using silver clay, and a lovely piece of aqua sea glass. You can read more about the company behind Art Clay Silver here. Since I first thought about making jewellery, way back in the first Summer after leaving full time teaching, I wanted to adopt a sustainable approach to the work and started by making driftwood beads. This was a big fat fail due to not knowing how to actually work with the beads once I'd made them so I spent some time working with beads and wire to improve my skill set. Once we moved house in Spring 2010 I was able to move on to develop various techniques for working with silver and I am really enjoying what I'm learning. Now I am at a stage where I use approximately 70% recycled materials in my jewellery work including sea glass and pottery, Art Clay Silver and recycled packaging materials and am hoping to improve that further over the next year. Having been researching this area for some time and having encountered some other UK based jewellers who desire to continue making jewellery in a more sustainable, even ethical way I thought I would share some links with you. If you are at all interested in this area please do get in touch and if you have any suggestions I'd be very grateful. The aim of Green Silver is to give independent jewellers and metal smiths the power to buy their silver from recycled sources, at a decent price. "Our Gold and Platinum are sourced from our partners Oro Verde™, and are therefore certified Fair Trade. Our silver is not. Despite much searching, we have not been able to find an artisanal supply of silver that is both ecologically sustainable and benefits miners. We continue to work at this, but until we get there we will continue to use our own 100% Recycled Stirling Silver, sourced from here in the UK. We believe this is a better ethical alternative than using silver from mines that damage the environment by using chemicals such as mercury and arsenic. I have been in touch with both and will hopefully soon be able to use recycled silver wire and sheet in my work. Do get in touch with them if you are interested, the more people getting involved in using sustainable silver, the more likely that there will be a supply for UK jewellers. You should check out the fabulous Ute Decker's website for a glance at her amazing work and to share in her vast research into ethical jewellery which includes the media's dealings with and debates over the whole issue of ethical jewellery, tips to 'greenify' your jewellery bench and supplier links. I wanted this post to be positive as I'm quite sure I don't need to bombard you with horrendous images and facts about the negative impact on both human life and the environment mining can have, but just in case you need reminding you can read more here.